Suitably spooky goings-on... tricks, rather than treats, seem to be the order of the night. Publisher's blurb: "The Autumnal Costume Fete fills sleepy Five Lanterns, RI with outlandish garb sewn by the country's best costumers. This year, some of the outfits seem a little too real... and their designer will go to any length to keep his identity secret. A rash of missing children, the discovery of unholy texts, and gibbering lunatics wandering the streets, hide the true menace as it reaches for its blasphemous goal. Can the investigators solve these disparate clues in time to stop the Midnight Harvest? 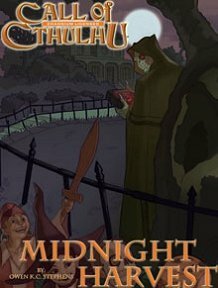 "Midnight Harvest contains everything a Call of Cthulhu group needs for an evening's worth of Mythos-inspired fun, including pregenerated characters."